(Saturday 15th March) Eight York delegates took part in the People’s Assembly Against Austerity’s delegate conference. Amidst the passionate and upbeat speeches were tributes to Tony Benn and Bob Crow, both founding signatories. In the motions debate, just about every aspect of austerity was covered. 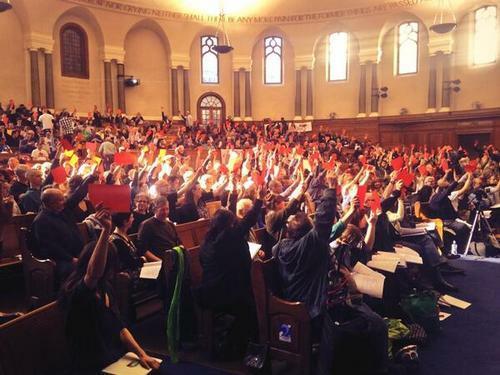 The conference ended with calls to back teaching and care-work strikes and build the national demonstration on 21st June. The Bedroom Tax and other social security attacks, were debated alongside unions and workplace rights. Early in the motions a big emphasis was placed on the need to nationalisation key resources, such as railways and energy companies. Later motions addressed the interactions between austerity and both climate change and global conflict. The final speaker, who moved the education motions, was National Union of Teachers leader Christine Blower, who implored us to stand with those who’s task is to educate a future generation.